Helical piers can reach greater depths than any other option and can be installed year round. Our engineers on staff can consult with you on your next project. In areas where soil conditions are less than desirable for building your structure, Empire Piers provides a life time of support - free from shifting and settlement. Empire’s helical piers are excellent for supporting low to high rise commercial construction, new residential buildings, and additions. If you are a professional contractor you owe it to yourself to rise above the competition and gain more jobs using helical piers. Our commercial helical piers are Instant, Foundation Ready, and completely guaranteed. 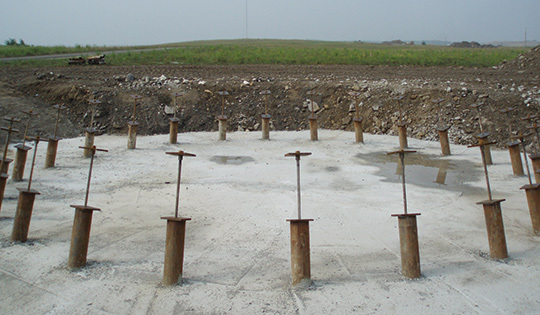 Unlike the equipment and processes required to install other deep foundations, helical piers do not create any soil spoils (excavated dirt) that must be removed or distributed within the site. The installation equipment is small, easily maneuverable and does not create vibration. These features and benefits make helical piers an efficient and affordable solution for job sites with restrictive access or environmentally sensitive conditions.